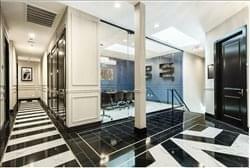 Find My Workspace lists over 95% of the executive office suites market in Great Neck. Simply click Request Quote to check pricing for one office, or Add to Basket for multiple offices. This location its in the middle of the business district and is surrounded by shopping, restaurants, banks, and has several municipal parking lots which surround the building. This center has a beautiful and elegant look that appeals many business owners and clients. Amenities include: wifi, parking, kitchen, cleaning services, conference rooms, coffee/tea, tenant controlled AC and Heat. To obtain information for your selected New York Executive Office Suites, please tick the "Add to basket" box for each office you prefer and complete the form below. We will then send a detailed report via email.